Description: The Clinch Ranger District of the George Washington-Jefferson National Forest maintains three recreation areas in south-west Virginia. 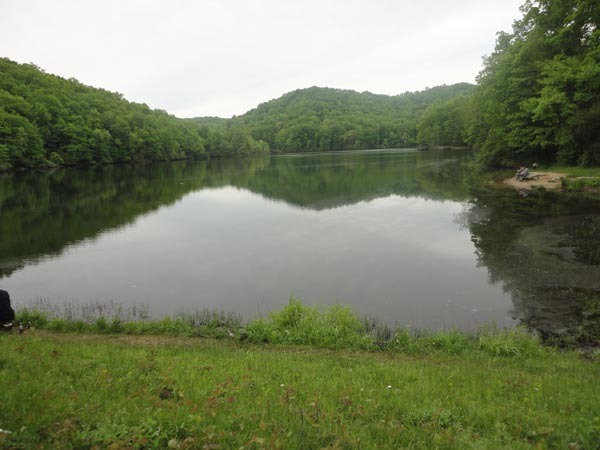 The Bark Camp Recreation Area offers a thirty-nine site campground (nine electric) with showers and potable water, picnic area and a 45 acre lake that is frequently stocked with rainbow trout. 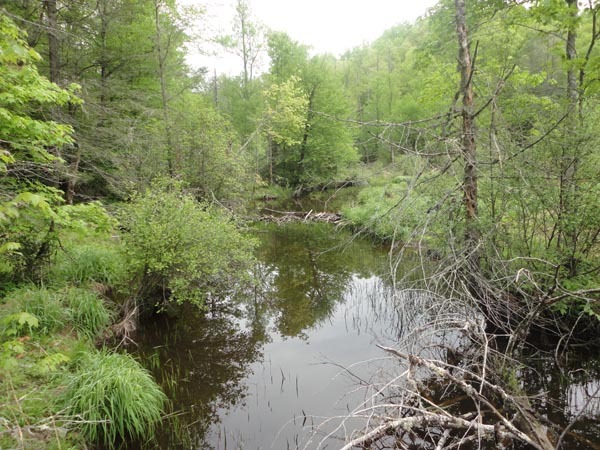 It also serves as a stop along the 19 mile (if one includes the three mile Falls of Little Stony N.R.T.) Chief Benge Scout Trail. It is a fee area: $3.00/car. 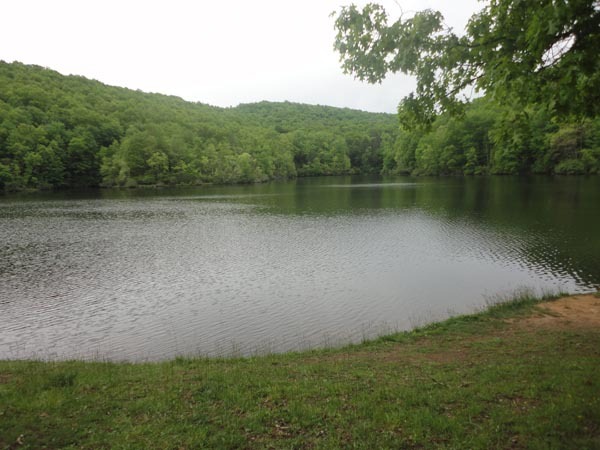 Described here is the perfect family outing if picnicking in the area or spending the night at the campground. 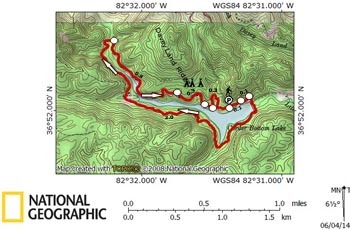 Its 3.5 miles uses a section of the above mentioned trail and the Lake Shore Trail to form a loop. 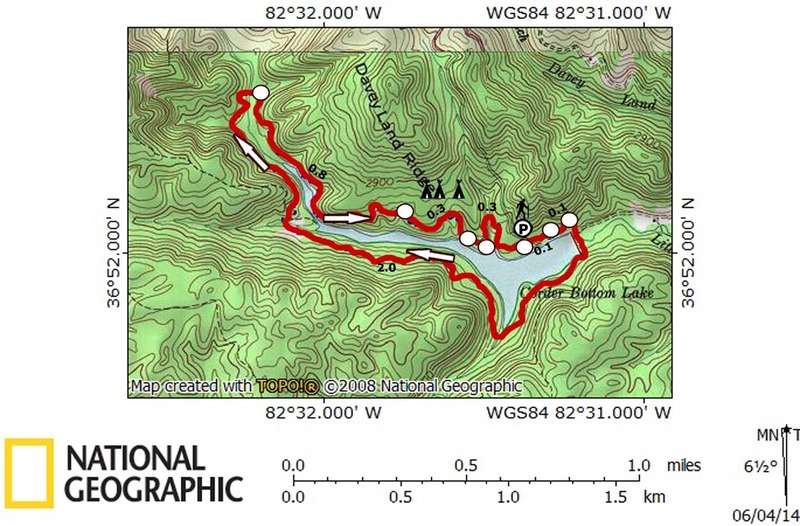 The hike, as described here, starts at the picnic area but there are spur trails from the campground that led to it. Trail Notes: From the parking area walk across a grassy area to the lake. Turn left onto the paved trail. Enjoy constant views of the lake. Cross the boat ramp in 0.1 miles. The asphalt trail ends here. Continue to follow a fisherman抯 path for another 0.1 miles, passing a large boulder on the right. Make a sharp right hand turn and climb a set of steps to the top of the earthen dam. After crossing the dam turn right onto an unsigned but otherwise obvious trail. 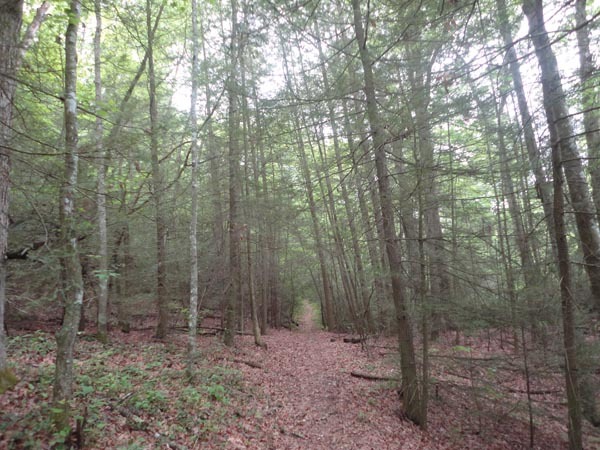 In a few steps you will begin seeing the yellow blazes of the Chief Benge Scout Trail. 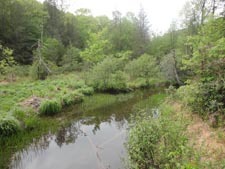 For the next 2.0 miles for the most part the trail closely follows the contour of the lake as it passes through hardwood forest, hemlock groves and rhododendron tunnels. In late spring look for Canada Mayflowers growing along the trail. 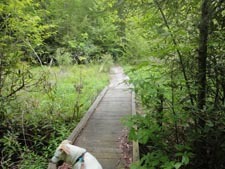 At the end of this section the trail crosses Little Stony Creek and its swamp on two boardwalks. Bear right after the crossing to pick up the unsigned Lake Shore Trail. 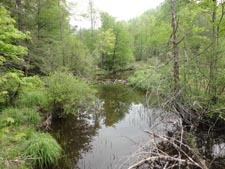 Dense rhododendron tunnels are the norm along this stretch with perhaps a few window views of the swamp and upper section of the lake created by beavers. Their gnawings will be apparent. In 0.8 miles pass a spur to the upper campground spur and in 0.3 and 0.1 miles two more campground spurs, the last with steps. 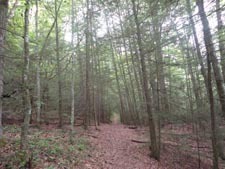 The trail bends away from the lake as it follows a false cove for 0.3 miles before rejoining the paved trail at the picnic area you started on.